How to prepare our cities for the post-fossil era? 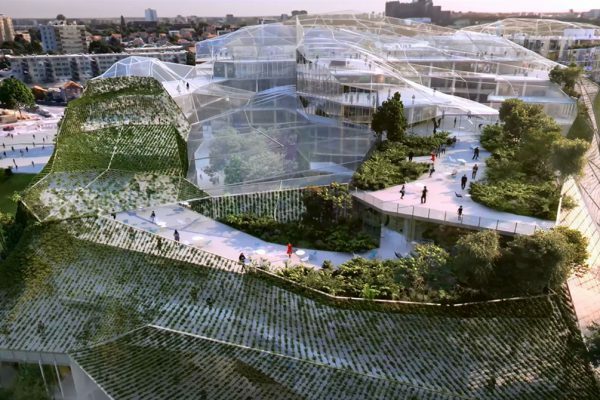 The award-winning Belgian-born, Paris-based archibiotect Vincent Callebaut has a vision — and it’s truly inspiring. We sat down with him right before his keynote lecture at the opening session of the EU Green Week conference in Brussels. Callebaut’s portfolio is full of mind-blowing visionary architecture that makes cities and nature become one. Browsing through floating ecopolises, vertical urban forests, and residential buildings with integrated urban farms, you may think that these eco-modernist utopias will never become a reality. But with the urgent need to cut our fossil fuel consumption in the years to come, cities across the world are getting the swing for Callebaut’s spectacular green urbanscapes. By the end of 2018, his first building, a residential tower in Taipei, will be completed — “a prototype project that will be able to absorb 135 tons of carbon per year, and produce all the necessary energy for the inhabitants directly on-site.” There’s more exciting projects planned in Cairo and Paris. The Tao Zhu Yin Yuan project in Taipei is expected to have 25,000 (!) plants on its balconies. Integrating nature into architecture requires a completely new skillset from architects. You once stated that our cities, with all their stacked shoe boxes along traffic corridors, are very much based on individual mobility. How’s that going to change? There seems to be quite a gap between your futuristic ideas and the reality in today’s cities. How do you deal with that? How do you imagine nature to become part of our living environment? With 70% of humanity living in cities by 2050, how do you see the role of the countryside? What are the challenges for your office? We’re pretty big fans of the work of the French street artist OX, so it was a pleasure to hear that publishing house International Neighborhood Verlag has released the first comprehensive monograph on his work.